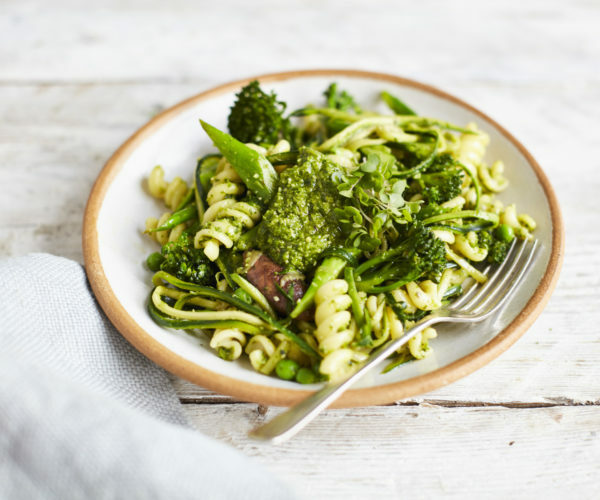 This pasta dish is packed with green goodness without lacking on flavour, thanks to a delicious, freshly-made basil pesto. Ready in a few simple steps, this dish makes the perfect week-night supper, and leftovers will make a tasty and hassle-free lunch! Thanks to our winner of the Tenderstem®National Recipe Hunt, Isabel Morgan, for this recipe. In a blender, add half of the Tenderstem®, garlic, spinach, basil, pine nuts, lemon zest, olive oil, and a pinch of salt and pepper, and blend until smooth. Heat a teaspoon of olive oil in a pan. Add the mushrooms and remaining Tenderstem®, fry until the mushrooms are a slight golden colour and the Tenderstem® still has a slight crunch, then add the courgette. Once the courgette is cooked through, turn off the heat. Once cooked, drain the pasta and peas (leaving a small amount of the cooking liquid to loosen the pesto).